Snow and ice can damage bird feeders, clog feeding ports, and spoil birdseed, but birders who protect their winter feeders will be able to offer a bountiful buffet that birds can easily eat even in the harshest weather. While these simple steps can prepare your feeders for winter, more thorough winterizing preparations may be necessary to help your feeders be the very best for your winter birds. In general, the harsher the typical winter in your area, the greater your preparations will need to be to protect feeders through the season. Bird feeders need to be protected from excessive moisture in the winter to prevent seed from spoiling, and they need to be safe for wary winter birds to use. Fortunately, it is easy to protect your feeders and make them more attractive to winter birds. Choose Winter Feeders: Opt for bird feeders that are suited to winter weather by choosing designs with a larger capacity and protected reservoirs to keep birdseed dry. Feeders that have built-in covers or underneath feeding stations are best, and it is important to avoid cloth netting feeders for winter finches, as the cloth can hold moisture and cause seed to clump and spoil. Instead, opt for metal mesh feeders or tube feeders for Nyjer. 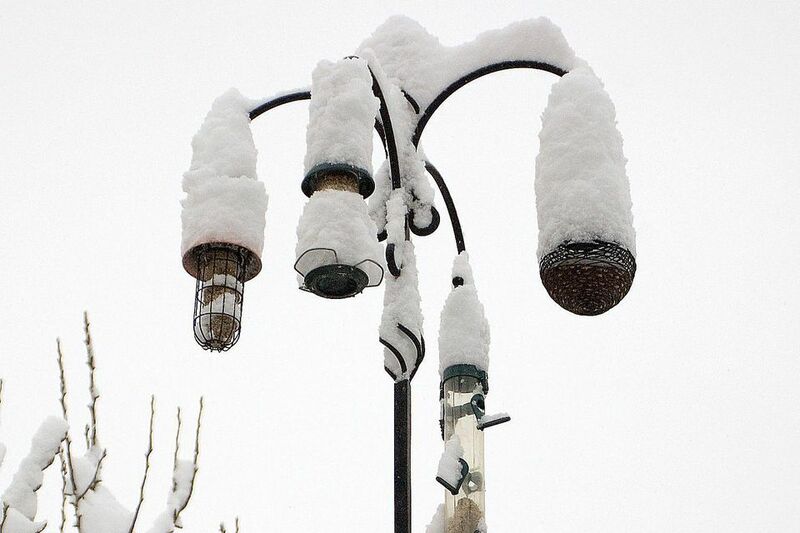 Cover Feeders: Adding large baffles or covers to feeders in the winter can keep snow and ice from accumulating on the feeder and will also give birds a more protected place to feed. Clear acrylic bowl-shaped baffles are popular for sheltering winter feeders, and many birders improvise by creating feeder covers from old bowls, pie tins, umbrellas, or other recycled materials. Reposition Feeders: Moving bird feeders to sheltered locations in winter can help protect them from snow and ice and make them easier to refill. Hang feeders from thick tree limbs close to the tree's trunk, under the roof's eaves, or under a covered patio, deck, or gazebo. The closer the feeders are to the house, the easier they will be to keep filled even in poor weather. Discourage Wildlife: Birds aren't the only animals hungry in winter, and bird feeders can attract squirrels, raccoons, deer, and other wildlife looking for an easy meal. To discourage these visitors, take steps to squirrel-proof bird feeders and surround feeding areas with cages or fences to ward off other animals. Avoid excessive ground feeding that can attract pests, or consider an easier, alternative feeding station for winter wildlife separate from bird feeders. Clean off snow and ice after every storm, or during extended storms, to give birds easy access for feeding. Check that feeding ports are clear and seed can flow freely for birds to snack. Refill feeders frequently with the best winter foods to provide a reliable, healthy food source for hungry winter birds. Opt for foods that are higher in fat and calories to give birds adequate energy on cold days. Shovel or trample snow in ground feeding areas to allow juncos, doves, and other ground-feeding birds easy access to food, or position a large patio table or other cover over ground feeding-areas. By taking steps to prepare feeders for winter, protect them in the harshest weather, and keep them suitable for the birds all season long, birders will enjoy the company of many different winter backyard birds that take advantage of the tasty buffet.